Bangor University Peer Guides have been congratulated and awarded certificates in thanks for the vital role they have been playing in supporting their fellow students. Bangor University runs one of the oldest and largest ‘Peer Guiding Schemes’ in any UK university. The trained ‘Peer Guides’ play a vital role in assisting new students to settle in to university life, helping with everything from the practicalities of moving in and finding their way around university, to assisting in supporting students in adapting to university life and signposting them to further information and support when necessary. "The Peer Guides’ commitment and contribution made to Bangor University life is invaluable. Not only do the Peer Guides organise and run events through Welcome Week, they are on hand to assist new students in adjusting to University life. They can make a difference between a student deciding to stay or leave during the first few weeks away from home. The also make new and lifelong friendships with their students." While all the Peer Guides were thanked for their work in supporting their fellow students, one student received the annual Peer Guide of the Year Award. All first year students are asked whether they wish to nominate a student ‘who has gone the extra mile’ in their support of their fellow students. 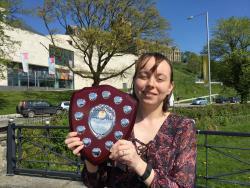 This year’s winning student was Catherine Rhian Suddaby, a third year Social Science student.